Just in time for the Christmas season, Psycho Baby has released its first line of customizable tattoo-inspired wall art for the newborn or about-to-be-born rocker baby on your list. 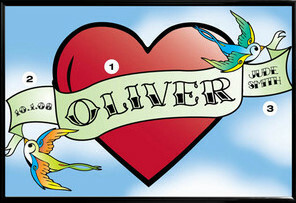 The 11″ by 17″ framed tattoo prints are reminiscent of old-school flash – with hearts, sparrows, doves and banners – are fully personalized, and can include the baby’s name, the birth particulars and the parents’ names, depending on which print you choose. Each print is made to order, framed, boxed and shipped to your door for under a hundred dollars (a godsend in this time of economic crisis, let’s be honest here). Check out the Psycho Baby Custom Prints Tattoo here and be sure to check out their other really cool tattoo-inspired baby merchandise – including bibs, clothes, diaper bags, the works – for other great gift-giving ideas.